Hair loss is a very common problem affecting both men and women. The professional term is alopecia and it happens due to a number of reasons. It could happen due to hormonal imbalance, poor diet, allergies, stress, genetics, poor hair hygiene and bad quality hair products. There are a number of commercial hair care products which guarantee amazing results and fast hair growth but in reality they are often expensive and ineffective. Instead of spending thousands of dollars on these ineffective products you can try out some of the natural remedies which are cheap, readily available and give real results. The remedies we’ve compiled for you have been used for centuries and are guaranteed to improve your hair quality, boost hair growth and stop hair loss. They also nourish the hair follicles. Moderate hair loss is normal from time to time and it happens to almost everyone. Your hair regenerates and old hairs fall out making room for new ones. But if you notice this happening in excess it’s time to do something about it. 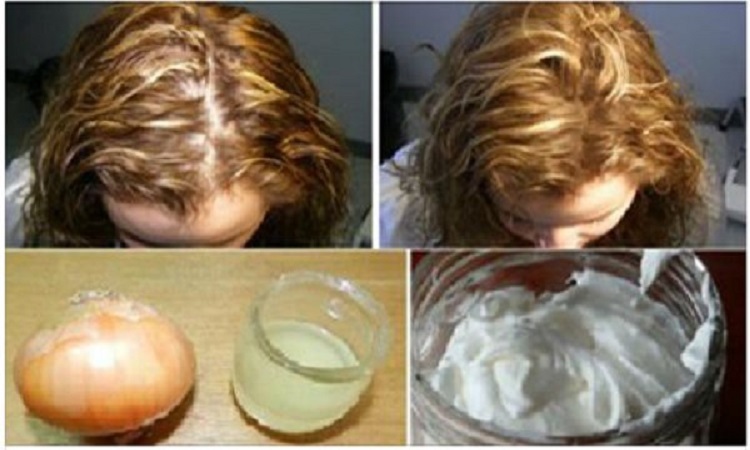 Here’s what you can use and stop hair loss permanently. Coconut oil has over a dozen uses in hair and skin care and it may be the most effective ingredient which stimulates hair growth. It contains essential fats, minerals and proteins and prevents hair breakage. It also abounds in potassium and iron, among other. You can either use coconut oil or coconut milk. Warm some coconut oil and massage your scalp and hair from roots to tips. Leave it in for an hour and then wash it off. You can also use coconut milk, just grate the coconut and squeeze the milk. Add some water and mix it all well. Apply the mixture on the affected area and leave it on during the night. Wash your hair in the morning. Onion abounds in Sulphur, which benefits your hair by increasing collagen production, stimulating hair growth. It can also control and effectively stop hair loss if used on the scalp. Just chop one onion and squeeze the juice. Apply it on your scalp and leave it on for 15 minutes. Then you can wash your hair like you normally do. Air dry your hair and repeat the process at least two times a week. Just like onion, garlic is rich in Sulphur and has the same effect on your scalp and hair. That’s why it can be used as a natural remedy for fast hair growth. Take a few garlic cloves and crush them. Add some coconut oil and bring the mixture to boil. Set it aside and wait until it cools down. Apply it on your scalp and gently massage it. Leave it on for 30 minutes and wash your hair like you normally do. Repeat the process twice a week for maximum results.